Shelby Railroad Service, Inc. specializes in complete repairs and service of all your rail car mover equipment. 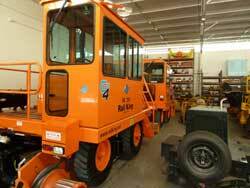 Not only do we specialize in Rail King, we repair / recondition Trackmobile, Shuttlewagon and other brands. Shelby Railroad Service, Inc. can completely refurbish your used Rail Car Movers, whether they need cab repairs, engine or transmission rebuilding, body work, or a new paint job. We can also give your used Rail Car Mover a new paint job with decals, which will most certainly improve the looks of your equipment. Just give us a call. We can furnish substantial mission control reductions to meet Federal EPA Standards. We also repair all bodies, flooring, etc. that have rust, holes or major damage due to a derailment. We’ll repair air, oil, hydraulic lines and inspect all electrical wirings, along with other electrical components. For older / outdated rail car movers where, occasionally, parts are not available from the manufacturer, Shelby Railroad Service, Inc. often has the ability to manufacture a replacement part. Whether you are looking for a field or shop service support, welding / fabrication work, hydraulic repairs, or engine / transmission work, Shelby Railroad Service, Inc. has the ability to meet your needs. With a fleet of field service vehicles and facilities with factory trained technicians, we offer the most complete line of product support for your rail car mover needs. Shelby Railroad Service's goal is to develop a product support strategy with our customers to optimize the performance of your rail car mover and lower operating costs. By offering a complete line of services ranging from total rail car mover rebuilds to changing oil / preventative maintenance, Shelby Railroad Service's service organization is committed to your success and profitable bottom line. While your rail car mover is in our service shop being updated / reconditioned, we can supply your company with a small or large rail car mover from our rental fleet. Whether it’s a Rail King, Trackmobile, Shuttlewagon or any other brand, just give us a call.